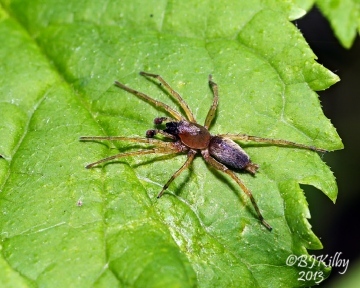 The spider can be found amongst low vegetation and detritus in a wide range of habitats, most often in damp or marshy situations, but also scrub grassland, nettle beds, rubbish tips and heathland. The female can often be found with her eggs in a retreat constructed in a curled leaf held with silk. Adults of both sexes are found mainly in late spring to mid-summer, females occasionally persisting into the autumn and winter. Original author of profile: W.J. Partridge using information from Bristowe (1958), Crocker and Daws (1996), Locket and Millidge (1951) and Roberts (1995).